Garage door springs are the components that are in charge of providing a counterbalance to the weight of your door panels and helping the system operate. As a result, they are under tremendous amounts of tension on a regular basis and must be properly maintained in order to ensure their smooth operation and safe working condition. Anytime your garage door system is experiencing any type of spring related issues, the best thing to do is to seek professional assistance. These components can be extremely dangerous to handle without the proper tools and the professional training, and any mishandling can lead to catastrophic results. It's usually important to replace both extension springs even if only one of them broke, as the other one would have sustained the same amount of wear and tear damage and is likely to be not far behind. 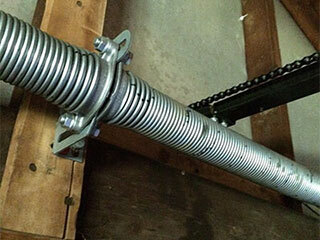 There are two main types of garage door springs that are used in residential systems. The extension type ones are springs that stretch and contract in order to support the door's weight during operation. They are installed parallel to the length of the ceiling, one on each side of the door. Due to the nature of their action, they are considered more dangerous, as they can whip around your garage when they break. Torsion springs, on the other hand, operate quite differently. They twist and unwind to achieve the same goal, but they are installed above the door, parallel to its width. For these reasons, they are considered safer and more durable. Garage door springs have a finite lifespan, but with some routine maintenance they can end up lasting you for much longer than expected. By examining them on a regular basis and providing them with the proper lubrication, you can sometimes double the lifespan of your springs. If you do find that these components have sustained a lot of damage, it's important that you get them replaced promptly as if they end up breaking, your system will sustain needless damage. Whether you have torsion or extension springs installed, it's very crucial that you do not try to perform any repair or replacement task on your own. Our experts at Garage Door Repair Chicago can help you when your springs are showing signs of trouble. Call us today.